benjamin pointed to the way, as marx did before him, in which new technologies and products mimic old forms. early photography mimicked painting, the first cars were designed like stage coaches, newly processed iron was used for ornamentally rather than structurally, aping nature in the form of leaves, or to resemble wood. steel columns were to resemble the greek orders, industrially produced utensils were decorated with flowers, fauna, seashells, and to look like greek and renaissance antiques. even the new spaces of the city were fashioned in the classical manner of a previous age. benjamin noted ‘in the middle of the last century no one yet had an inkling of how to build with iron and glass.’ iron and glass had “come too early’ and unable to find its own form. the passagen-werk notes: ‘transportation in the stage of myth ‘industry in the stage of myth.’ nineteenth-century architecture and ‘architects mimic the pillars of pompeiian columns; factories mimic private villas, as later the first railroad stations are modelled on chalets’ 1935 exposé ‘one simply transferred the way of building with wood onto iron’. pushed ever onward by the new orders of production consciousness lags behind and this expresses itself unconsciously in archaic form. marx points to the fact that revolution is also rapped in the classical guise when it first makes its appearance on the streets and certainly in the way it is represented in art. the parallel here to events in prehistory where new technologies in the transition from the neolithic to the bronze age take on old forms. this is demonstrated most strikingly at stone henge where the large sarsons forming the large inner circle together with their cap stones were ‘morticed and tenoned’ mimicking the timber structures and timber technologies that preceded them. under these dual masks of archaic classical myth and traditional nature, the inherent potential of this second nature, both new mode of production and new ways of organising it socially —machines, iron shaped by new processes, technologies and industrial materials of every sort—remains incomplete, unrecognised, unconscious. 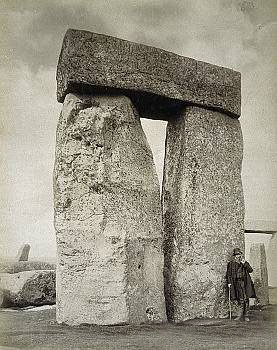 longing for a ‘return’ to the site of pre-history, a mythic time when human beings were reconciled with the natural world. ‘fashion, like architecture… stands in the darkness of the lived moment’ [im dunkel des gelebten augenblicks], still unable to illuminate its critical path and descending into an alienated forms of consciousness. the promise of technik is truncated making for a ‘poverty of experience’ by the incompleteness of its social ordering.